The bitter cold temps are setting in with a shiver. I am less die hard this winter to keep up a conditioning schedule and am encouraging some physical rest during the coldest days working on mental and basic retooling of some simple things. I also went through the tacking up routine asking Khaleesi to be more focused and still through the process. It was a good session ending with me walking her to the stool and mounting – planning to work on her standing still. She ‘picks me up’ beautifully wherever I ask (a stool, mounting block, rock or tree trunk) and she stands great when I climb up but after I lower into the seat as I find the other stirrup and situate myself she begins taking steps. Prepared to spend some time mounting and dismounting that afternoon I lowered myself into the saddle and waited… no movement… then found my stirrup, rubbed her… unhooked my crop … sat there a moment. She didn’t move a hoof. I got down, rubbed her like the good mare she is and walked right back in the barn to take off the saddle. The next session I began with some transition work (asking for walk vs. trot) on the ground and added some obstacles in the yard. It was fun- it was new enough work that I really had her attention. Then tacked up easy, mounted at the stool and she stood but not long enough for me to finish my adjusting and walked off to the gelding field. In this case I decided to let her. When we got to the gate I put her immediately into a circle and returned exactly back to where I mounted and tightened my girth, adjusted what I needed to (taking my time) and she stayed exactly put. I was pleased we didn’t have to repeat that conversation – she didn’t ask to return to the geldings again. I pointed her toward the gate to the woods and she went willingly at the speed I’d asked (a nice walk). After the ride on the dragon the week before when she argued with every single decision I made I knew it was time for working alone on the trail to sort a few things out…..
… this brought reflection about some riders who have a rule about not riding alone. Though I completely understand they feel it is a risk to ride alone in the woods- I believe just as strongly that it is one of the most important things I can do to help increase my overall safety doing anything on my horse. Let’s face it. We all know riding horses is dangerous. Horse riding is listed in the top 10 most dangerous sports along with BASE jumping, bull riding and running with the bulls (is that a sport?! ), boxing (where people expect to get beat up), and gymnastics (anyone here got a daughter who does gymnastics and rides cross country!? You’d better have a good insurance plan!). For me- in hope of mitigating some of danger involved (because freak accidents happen in every sport or activity including getting hit by a bus riding your bike or cutting your finger off with a knife making dinner) at least if I’m going to be riding a thousand pound animal with it’s own brain- I’m going to try to find a way to work with the animal that she might not WANT to throw me into a tree ON PURPOSE. The problem is….. From the evidence I’ve seen, many equestrians have never considered what it is that a horse actually needs from us — forget about being able figuring that out (because it is very hard for humans to see things without imagining everyone and everything thinks like we do), then if you do figure it out actually making the consistent adjustments is probably the hardest part- even for those I’ve seen who are dedicated to doing it. Thankfully horses – I believe a gift from the creator of the universe to us– are one of the most generous creatures in spirit and allow humans to do much that physically forces them, demean them (assume they are not intelligent), and misunderstand them… misunderstand what we’re doing… yet they continue to protect us and work for us regardless. I’ve been asking myself for a while now as most of my readers know- how can I be different from what I see around me? I’m the same as all humans when it comes down to it… so how can I basically overcome my human-ness and be successful which in the end means my horse is the winner. One thing I notice is how humans tend to sell ourselves on the truth we hope for when honest observation may show just the opposite. I am an expert on this because I’ve done it. And I’ve watched it around me- I see it more and more as I’m aware of what it looks like. They live in the moment and only in reality. They don’t lie to themselves, each other or us. I’ve watched people overlook the observable reality for the story they prefer. Especially if it’s one that makes us feel better about ourselves. The hardest part is that it’s always easiest to see someone else’s story and preferred reality than our own. I often ask… God open my eyes to see when I do this myself and protect me and my horses from my ignorance and selfishness…..
One way to begin paying more attention could be to always ask the question as we all consider our horsekeeping and riding decisions… all of them…. is this the best scenario for the horse, truly? 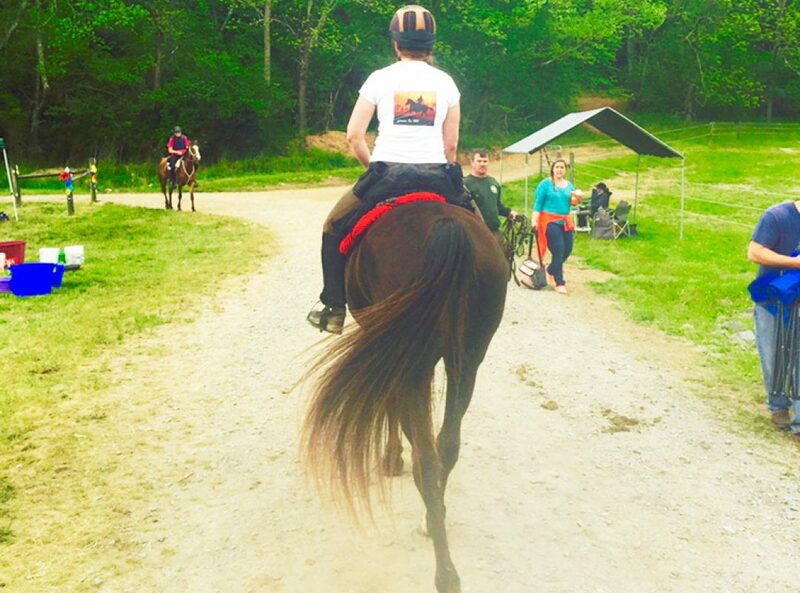 …..riding alone is a vital part for me to connect to my horse and communicate. It doesn’t have to be on trail in the woods- it certainly can be in an arena or ring of course. But there’s something about being alone together- not another horse in the mix, and not another human to focus on either. Since I am at heart a trail rider I hit the woods – but alone I use those trails like my own arena and every step on this ride was intentional. I asked her for exact speed and gait. I worked on trot/walk transitions. I worked on stopping and starting, on lateral moves both stopped and in motion. I worked on a nice back up. I wound through trees and went on and off the trail. Except 12 meter circles I’d say I did just about everything useful in a good session to connect with my horse and be sure that I was clear and she understood me. Funny thing I used to feel I could get easily bored on the same trails, but when I focus so much on really riding I could loop that 2 miles for hours and still have interest in what I’m doing. It was a fantastic ride and when we returned to the barn and returned to the field she was relaxed and I was content. It’s hard to be that specific when there are other people and horses- at least for me. It’s an interesting balance to find. Of course I don’t think it’s a bad thing to go for a ride with friends and chat. I love doing that. However she isn’t a bike. I have a smart mare who deserves for me to really ride her and not just sit on her basically assuming she’s on autopilot while I catch up with friends. Also I don’t mean staying physically balanced and have nice hands. That isn’t hard to do while chatting with friends. I do think each animal is unique. I think in the case of this horse she expects me to stay in the game or not bother. I do think she will take over if I’m checked out. Probably all horses will- but this mare seems to get resentful if I come back in to make a decision she doesn’t approve after I’ve been checked out. I find some evidence to back this up when I look at our competitive riding. She is connected to me at ride camp and we often ride many miles alone and because we are not in the fast group I have to pay close attention to how I ride her all the time- every section of that 50 miles matters if we’re going to finish. I will mention that I included the steps I’d been working on before getting in the saddle – like focused tacking up and transitions on the ground and expecting more at the mounting block- because they are key in starting to have more focused riding from the moment I drive onto the property and not just when I get off the property. Thing is, I do want a horse who I can ride in a neck string someday. A horse who goes where I point my mind and a horse that I simply imagine my leg moving and the impulse that goes down my leg is enough for her to respond before pressure is ever applied. I’m not going to get that horse by mindlessly grabbing her from the field and then zoning out on the ride assuming she’ll just take over. What I’ll have of course is a horse that I’ve trained to take over. Not saying I won’t be joining my friends to ride the trails… however I have to keep improving my ability to do more than one thing at a time… and to focus on my riding as well as function somewhat socially in a group of friends. The question in the end must always come back to: is this serving the horse or is it serving me? I hope I will choose to honor her first in everything I do. After all I do want her to put me first. That is going to also be much safer for me.